Mama Mia! : All the flavors of Italy, without having to deal with those damn Euros. If I were ever to move to another country, it would be Italy. Traveling there opened my eyes to a different way of life, a slower pace with an emphasis on family, friends and, of course, food. While yearning to go back and taste more of what each region has to offer, I instead explore our local Italian restaurants whenever possible, hoping to capture a bit of the country's convivial energy and classic dishes. Given Dave's Italian heritage and my own fond memories, we could eat pizza and pasta every day of the week. Neither of us had been to Mama Mia's, so we drove up to Felton, pulled into the Safeway shopping center on Graham Hill Road and stepped into a bustling and warm restaurant. 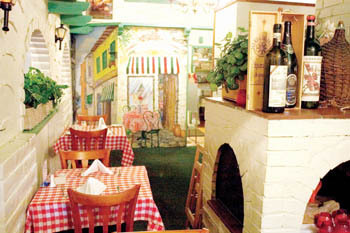 The two dining rooms were filled with families, laughter, an energetic waitstaff and upbeat Italian music. Red-and-white-checkered tablecloths adorn each table, while wall murals and rustic décor abound. Walking to our table, I noticed large portions, tempting thick-crusted pizzas and the fact that everyone seemed very happy. Buoyed by the friendly ambience, I had to order a glass of the Chianti Placido ($4.75), which was exactly what it should be: a smooth table wine, simple enough to drink all night long. Dave chose a local favorite off the reasonably priced wine list, the 2001 Thomas Fogarty Skyline ($6.25), full of chocolate and tart fruit. Along with our drinks came a basket of randomly shaped breadsticks and a little bowl of an orange-hued substance that took us a while to identify as some sort of cheese-flavored sauce. The chewy breadsticks, most likely leftover pizza dough, made me want to try the pizza because of the great texture and balanced flavor. The dusting of dill on top seemed like an unusual herb choice, as opposed to the classic selections such as oregano, basil or rosemary. The Mama Mia menu features pizza, pasta and entrees with a few inventive twists and some nightly specials such as the family dinner deal for $27.50 or the Gilroy Garlic Scallops with prosciutto, basil and a cayenne beurre blanc sauce ($18.99), which happens to be a Garlic Festival recipe winner. We also noticed that there are four restaurant locations around the Bay Area, making Mama Mia's a small chain. Although the pizza looked really good, we both decided to order main dishes, which come with soup or salad, pasta and a seasonal vegetable. My salad was a mound of fresh mixed greens with carrots, cucumber, black olives and tangy herbed vinaigrette. Dave's cup of minestrone arrived lukewarm and without any beans or pasta, making it more of a vegetable soup. It was brothy yet zesty with fresh veggies and a hint of spice. I chose the Eggplant Scaloppini ($13.99) after a high recommendation from our server. Half of the large plate was heaped with breaded and fried pieces of tender eggplant, lightly smothered in a rich and salty tomato sauce with parsley, onions, mushrooms and tons of garlic. All of the flavors mingled together evenly in this hearty and decadent dish. The other portion of the plate held a little scoop of slightly overcooked penne in a marinara sauce and a pile of briefly sautéed chunks of zucchini, carrots and red onion. The veggies offered a light and fresh respite from the savory heft of the eggplant. Dave's last minute decision of the Veal Monterey ($15.99) was not as successful as my own. The thin veal cutlet was tough and then drenched in a cream sauce with shrimp and green onions. He also got the same sides of pasta and vegetables and ended up eating every bite, regardless of his regret at not ordering the Papparadelle Bolognese or the Lobster Ravioli. Despite Dave's unfortunate choice, our evening at Mama Mia's was enjoyable and entertaining. We were lucky enough to hear a full-staff birthday greeting, full of clapping and singing, not once but twice in the course of one hour. This place has colorful atmosphere, cheerful music and ample amounts of Italian-American food, accessible to everyone with the welcoming warmth that eating out should always provide.